The biomass burning consists on a complete system, created to produce energy using biomass as fuel, through an innovative method of high combustion efficiency and reduced loss. Agricultural biomass can be burned due to its chemical composition and high calorific value, but it has the problem of melting of ashes on the walls of the combustion chamber and the emission of light ashes into the atmosphere. 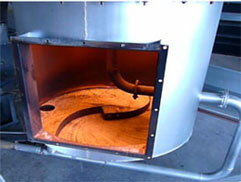 Moreover, the density and moisture of the biomass can vary, which causes additional problems. Experiments were conducted using various sources of biomass, such as corn waste, barley waste, wood pellets, walnut shells, etc, that are produced in enough amounts for a stable fuel supply through time. The reached temperature in the combustion process of agricultural wastes does not exceed 700ºC and produces ashes that are considered as low melting temperature, what leads to the formation of clinkers, which are gelatinous asses that, when cooled, they become vitreous and very hard. They are deposited don the walls and at the bottom of conventional ovens, causing deterioration through time and serious maintenance problems. 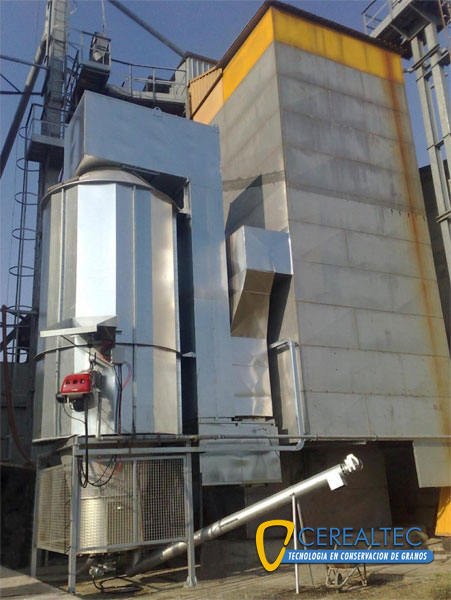 The system that we offer was designed to keep the wall’s temperature lower than the melting temperature, ensuring the non-formation of the unwanted clinker. The ashes can be removed from the bottom of the combustor through a system that collects and removes them from the equipment. 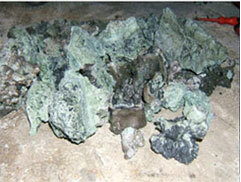 Then the ashes can be returned to crops, they constitute a very interesting source of minerals. 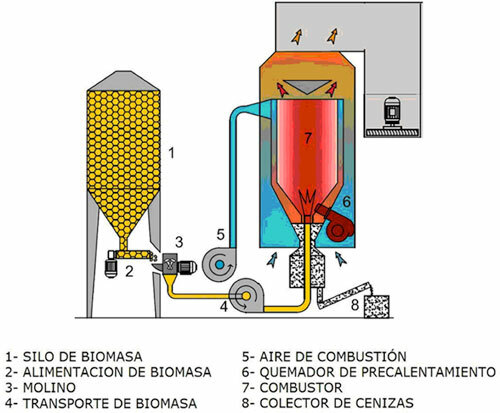 The conclusion of those studies were the basis for our project of combustion with pulverized biomass, burning biomass efficiently, leaving a minimum waste in the order of 1 to 2%. The equipment ensures complete combustion, thereby providing non-polluting combustion gases to the environment. 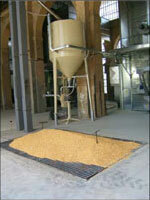 The biomass stored in the silo (1), is transferred to a hammer mill (3) through a feeder (2), controlled by an inverter. 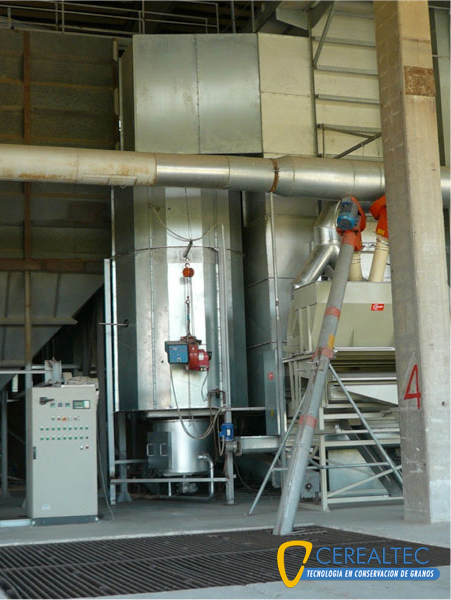 It sends the right amount of biomass to keep the exact temperature required by the process, controlled with accuracy of + / - 1 ° C.
The pulverized biomass is drawn by a fan (4) and sent under pressure to the combustion chamber. The gas heater (6) raises the combustion chamber’s temperature (7) until spontaneous combustion of biomass is generated. From that moment on, the gas heater is turned off and the process continues by self combustion. The environment air is drawn by a fan placed at the end of the pipe system, which controls the temperature of the burning walls. The calibrated outside air mixture, that flows with the combustion gases between the outer walls of the burning and its housing (7), determines the final flow rate at the required temperature. The ashes produced in complete combustion, are non-contaminant and are deposited on the bottom of the burning, being ejected by the ash scavenger (8) through a worm drive. 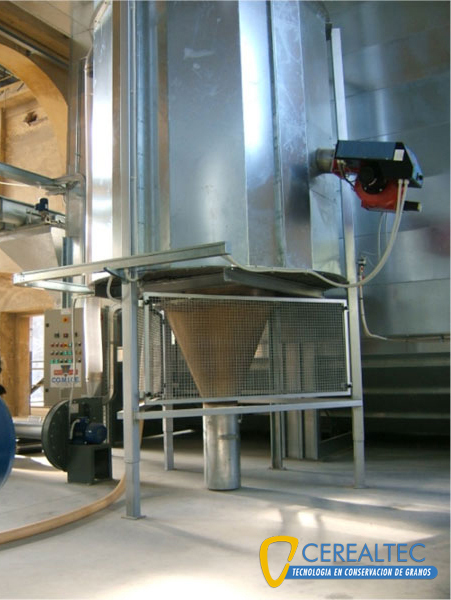 The biomass combustion system can replace the traditional energy source of dryers with a burning powered by milled grains waste (Corn, Soybean, Wheat, Sunflower, Barley, cob etc.). 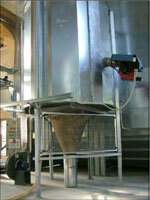 The equipment allows the utilization of dried agricultural biomass wastes as an energy source. La temperatura de inyección es controlada en tiempo real por un PLC, que en base a los datos obtenidos regula el calor generado en el combustor con la finalidad de obtener aire tratado con un a variación de temperatura de +/- 0,5 ºC. The injection temperature is controlled in real time by a PLC which, based on the obtained data, regulates the heat that is generated in the burning in order to obtain treated air with a temperature variation of + / - 0.5 ° C.
The gas heater operates in the preheating of the combustor. When the biomass ignition temperature is reached, it turns off automatically. It can only be activated again if the biomass is already depleted and it is wanted to continue the injection of hot air. 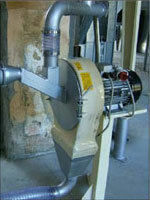 The burning does not require maintenance and the produced waste is self-ejected from the system through a worm-driver. The use of the equipment enables significant energy savings, reducing CO2 emissions and capitalizing the generated agricultural waste.